Theo Bosboom is a professional photographer from the Netherlands, specializing in nature and landscapes. In 2013, he turned his back on a successful legal career to pursue his dream of being a professional photographer. Although Theo is interested in all kind of images. He is regarded as a creative photographer with a strong eye for detail and composition. For Theo nature photography is the ideal mix between enjoying the wonders of nature and creative expression. What on earth does a photographer who is addicted to Iceland, rugged mountain lanscapes and pristine wilderness hope to find in the Netherlands and Belgium? These are two of the most densely populated countries in the world, and almost every square kilometre of land and water is used by someone, and nature has been largely created and regulated by people. It is still possible to experience raw, unspoiled nature and create exciting photographs? The answer is yes. It's not always easy, but it can done. Ducth photographer Theo Bosboom photographed in his native Veluwe and the Belgian Hautes Fagnes when winter was at its harshest, endured severe storms on the windswept Wadden island of Schiermonnikoog, delved into the wonderful world of damselflies, discoverd that autumn under water has its own dynamic, and revealed the destructive power of fire on the Veluwe and nature's subsequent recovery. The result is a beautiful and surprising collection of images that demonstrate a singular and creative view of nature in the Low Countries. >> It is silent in the world under water, and infinitely montionless. A leaf hovers, and the reflection of light is like the extinguished spark of a star. The surface is a silver line whose shades and nuances come fron the water’s depths and the far away sky. This is how the underwater world looks in the photographs or Theo Bosboom, who, with his camera, does not so much depict rugged, unbeatable nature as go in search of its sensitive heart, its fragile and airy forms. Above the surface, everything is different. The leaves blow in a gold and copper, they scurry – and when they touch the surface of the water for a moment, they turn into pictorial forms in a hidden wonder world. 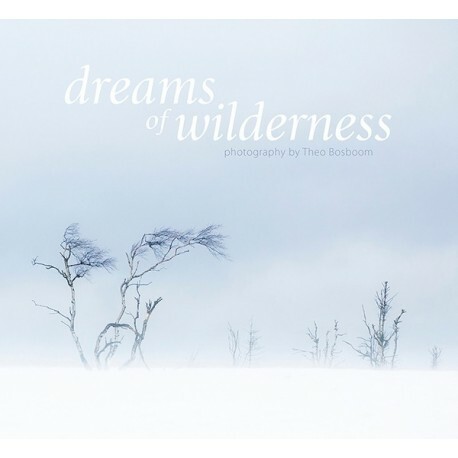 Theo calls his book “ Dreams of wilderness”, and it is an apt title.